Since Mediaeval times and right up to the end of the 17th century syllabub was a drink rather than a dessert. It was also a love token offered by dairymaids and milkmaids to potential lovers and was therefore and possibly by association, a favourite beverage for farmers and farmworkers in the fields at harvest time. The recipe was seemingly simple with the few ingredients readily available on the farm, the skill was in making it. 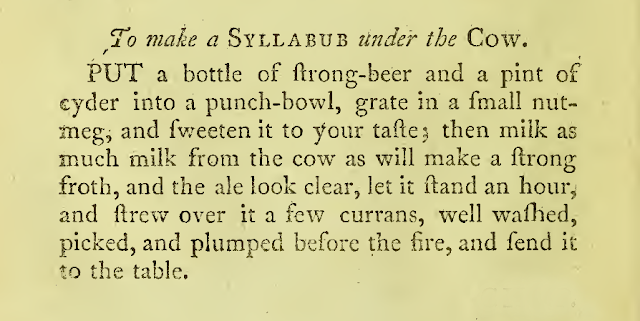 In original form it was a 'direct from the cow' recipe and although I can hand-milk, stopping the cow from putting her proverbial foot in it or kicking the whole thing over, would certainly put me off attempting it. The recipe below is from 'The Experienced English Housekeeper' by Elizabeth Raffald and was published in 1782. Apart from the clue in the title, she cleverly glosses over the hard part! In earlier versions the cow was milked directly into a bowl of crab apple verjus, sugar or honey. Made, as the name suggests, mainly from pressing unripe grapes or in English cookery, crab apples, verjus was a popular Mediaeval cookery ingredient. It was preferred to vinegar or lemon as a condiment or for déglaçage, as it didn't conflict with accompanying wines. In recent years verjus has enjoyed a renaissance, particularly in contemporary organic French and American cuisine, where it is used in vinaigrettes, sauces and marinades and for the same reason. It also fits well into the ethos of organic because it uses fruit thinnings, which would otherwise be discarded. *This is cream which has been left to stand and cool after full cream milk, such as A2 raw Normandy has been run through a separator. 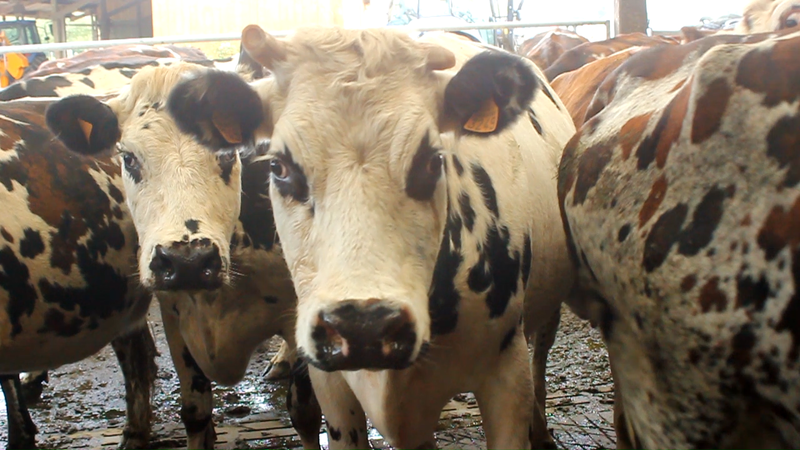 We got up at the crack of dawn to go and film the process at our local organic dairy farm, where we also helped making cider. The Cider film is below, if you'd like to see the fun we had in making it! You may be looking at the above list and thinking sooo simple. Well, not so because with organic quality raw products the depth of flavours is incredible. This is the irony of organic raw materials, which by their very method of production and lack of subsidy, will cost more than those of industrial farming but you do not need a whole host of extra costing ingredients, aromas and additives. If you use raw cane sugar (rapadura) the flavour will be even deeper than if you use the blonde cane sugar, the colour will change also. I like to add the raw cane sugar later as then the crystals remain intact and you get a delicious toffee taste and aroma to the syllabub. Experiment with the recipe, that's what cooking is all about! In order to permit this depth of flavour to fully develop, it is best to allow at least an hour for the ingredients other than the cream (and rapadura raw sugar if you are using that) to rest and infuse. However, if this is a last-minute party-effort do not worry, just make sure you have enough left over to enjoy by yourself the day after, when it will be richer, glossier and most indulgently delicious. Squeeze the juice from the half lemon and remove the outer layer of peel. Add the sugar and the cider and if possible leave for at least an hour to infuse. Incorporate the cream with a hand whisk or electric beater, just until it forms into 'leaves' or peaks. Do not over whisk! Here if you compare the photos you'll see the difference in shade and texture to a syllabub made with rapadura. Fill the shot glass to around half way to two thirds up with chilled cider. Add a good heaped teaspoon or more of syllabub. Decorate the top with a fruit or similar. Serve with a spoon and/or swizzle stick. The cider float can be drunk in the way of an Irish Coffee, either by spooning out the topping or by a gentle mixing in of the topping. You can make this in a non-alcoholic version by substituting clear apple juice for the farm cider. Ice Scream - Raw Milk Rich Vanilla Ice Cream Appetisers. The sixteenth recipe in my 100 Gluten-free Party Food Challenge.